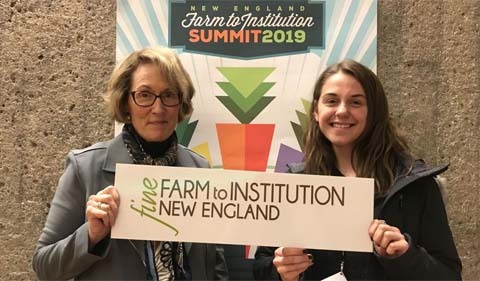 Dr. Theresa Moran, Food Studies Director, and Joy Kostansek, Food Studies Graduate Assistant, participated in the 2019 Farm to Institution New England Summit at the University of Massachusetts Amherst from April 2 to 5. Farm to Institution New England (FINE) is a network of nonprofit, public, and private entities across six New England states that work to grow the local and regional food system through institutional investment. 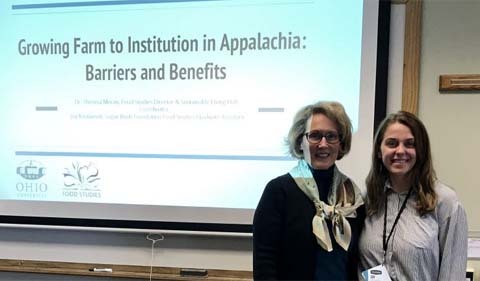 Dr. Theresa Moran and Joy Kostansek present “Growing Farm to Institution in Appalachia: Barriers and Benefits. Moran and Kostansek presented on the work that the Food Studies theme has undertaken this year with the Farm to OHIO Working Group. The FOWG is an initiative funded through Moran’s Sugar Bush Foundation grant with community partners Rural Action and Community Food Initiatives. The FOWG, they informed the conference attendees, is a monthly meeting of senior staff from Culinary Services, community organizations, the Office of Sustainability, and the Center for Campus and Community Engagement. The goal of this group is to expand regional food procurement at Ohio University. The FOWG has fostered a unique relationship of collaboration with Rural Action and Ohio University institutional stakeholders. Moran and Kostansek shared with conference attendees how the work of the FOWG has resulted in OHIO Culinary Services’ commitment to purchase seven produce items in summer 2019 as a launch for expanding greater regional food procurement. Also with the Sugar Bush funding, Rural Action is enhancing the capacity of regional farmers to meet the requirements of OHIO’s Central Food Facility through Good Agricultural Practices training. Rural Action is working with growers to ensure their GAP certification so that the growers can sell to Ohio University and to other institutions throughout the region, with the goal of have 20 farmers GAP certified by the end of 2020. Another element highlighted in the presentation was the student advocacy work undertaken by Community Food Initiatives. Moran and Kostansek pointed out that building student demand for local food is important to the overall success of the FOWG initiative. In addition, at the conference, they met with other Ohio regional institutional food advocates and learned how many universities use student farms contribute to campus sustainability goals. The conference provided a rich and stimulating food for thought on how, through regional food procurement and community engagement, institutions can work as agents of positive economic change in their regions. The conference highlighted how collaborative efforts with institutional dining and culinary service can contribute to sustainability metrics, as well as providing students with fresher, healthier food choices.